There may be other teams with slightly better prospects or more high-end prospects but there is no team that is even close to the prospects in the Detroit system whose top picks in the last five years were in the vicinity of 35th, 49th, 20th, 15th, and 19th. It is the Detroit way. The Red Wings take prospects that other have shied away from (for real or perceived issues), place them down on the farm, nurture them, cultivate them, teach them what it takes to become a successful NHLer and then call them for NHL duty when they are ready and slightly over-ripe. It works so well for Detroit that you would think that more NHL teams would try to emulate Detroit’s success. Well, it appears some of Detroit management alumnae are doing just that. 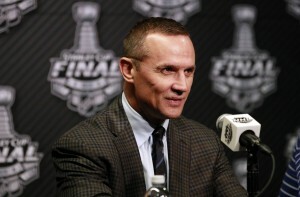 Steve Yzerman, the General Manager for Tampa and the NHL General Manager of the Year for 2014-15 and formerly Vice-President of Hockey Operations for Detroit, appears to be having success with his version of the Detroit way. Jim Nill, the General Manager of Dallas and former Assistant General Manager for Detroit, is doing his version in Texas. His team appears to be on the way up as well. Ken Holland has spent 30 years in the Detroit organization, 19 as General Manager. You don’t have this kind of longevity in sports without being exceptional. Not only has he kept Detroit successful over the years but he has been able to mentor some of the best young General Managers in the NHL. In spite of his past success, Ken will have to continue to work hard to be successful in the future. Detroit’s core players are nearing the end of their careers. Nicklas Lidstrom has already retired. Pavel Datsyuk is 37 and Henrik Zetterberg will be 35 early in the upcoming season. The chore of replacing core players is one of the toughest in hockey. The main way to replace core players is through the draft. For most teams, the only way to get players worthy of being considered core players is to suffer in the win-loss column for several years. It has never been Detroit’s way to tank so we shall see what the future brings. The only player currently on the Red Wings prospect list who appears to merit consideration as a future core player is Dylan Larkin. However, Lidstrom was a 3rd rounder, Datsyuk a 6th rounder and Zetterburg a 7th rounder. Maybe some others will emerge out of the woodpile from the Detroit prospect list like the last group of core players did. The top eight players on the Red Wings Prospect List have a strong chance of making the NHL and being impactful when they do. In addition, there will likely be some of the others who make the NHL, but they are either less likely to have an impact or less likely to make the NHL. Possessing eight impact prospects is above average amongst NHL teams. Only Winnipeg with 9 has more and only Arizona with 8 has as many. Los Angeles trails with just 1. None – It is the Detroit way. Of note, the author had Detroit ranked second out of all organizations. The Next Ones Summer Prospect List includes the top 10 prospects along with 5 honorable mentions and any other 2015 draft choices not previously listed. 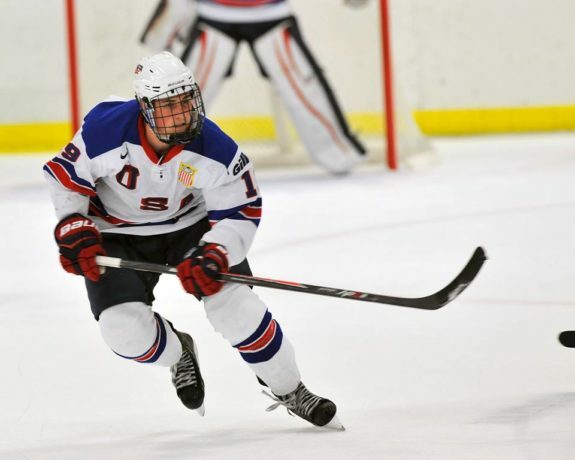 Yes, Dylan Larkin had a monster season playing for the University of Michigan and the USA U20 Team. He was a player that I had always liked but had under-estimated his offensive potential. If he continues to improve like he did this year, he could prove a replacement for either Zetterberg or Datsyuk. No, Anthony Mantha did not have the monster season that Dylan Larkin did and that everyone was expecting he would have had. A broken leg in pre-season and another injury later in the year slowed him down. He also took some time adapting to the pace in the AHL. However, towards the end of the season he started to improve and look more comfortable in his AHL skin. Big forwards sometimes take a little longer to develop and Anthony Mantha at 6’5 is definitely big. The 2015-16 season will give us a better idea if the former CHL player of the year is the real deal or not. I am betting that he is. His combination of size and sniper-like ability is rare. “Skating: Strong, good balance and agility, decent speed. Passing: Top notch physical passing ability. Needs to mentally use this option more often rather than try to do it all himself. Stickhandling: High-end, elite in tight quarters. Shooting: Wyatt Earp release, heavy shot with deadly accuracy – The Soviet Sniper. If Evgeny starts to use his teammates just a little bit better, Detroit could have something special here. Of, note he finished the season with 22 points in his last ten games. Xavier Ouellet had his cup of coffee in the NHL last season, playing 21 games for the Red Wings. For the most part, he looked like a player that the hockey analytics crowd would love – a puck possession, puck movement type of guy. He still could work on the strength side of things as he is only of average size for a defenseman. Xavier was the last cut for the Red Wings last season. I am expecting him to make the team this year. Teemu Pullkkinen has spent two seasons in the AHL and had more than a cup of tea last year in the NHL when he played 31 games. However, his play in those 31 games was not good enough to ensure he will be in the Detroit line-up in 2015-16. His play in the AHL where he won the league trophy for most goals (34) in spite of playing only 46 games shows a promise that he should be in the NHL soon, if not fulltime for the 2015-16 season. Pulkkinen is a natural goal scorer with a big time shot. So far, the limitations of his skating, size and defensive prowess have kept him from long-term NHL employment. Will 2015-16 see Teemu in the NHL or will he need to work some more in the AHL on reducing those limitations? Update: Teemu actually has to clear waivers this year; that means that he makes the big club, barring a trade. This is what I wrote about Alexel Marchenko back in his draft year, 2011, “OK, it’s 4th round and you need a power play set-up man with top-notch defensive and puck moving abilities and you want a reasonable sized frame, 6’2 or up, and someone who speaks good English – in short you want a late 1st rounder or an early 2nd rounder that you can draft in the 4th round. Luckily for you, Alexei Marchenko may be available.” And he was still available when Detroit nabbed him in the 7th round. Alexei still could improve on the strength side of things but otherwise seems ready for a spot on the Detroit blueline. The kid has size (6’2, 201) and real talent – top 5 talent in many categories. His skating is astounding – acceleration (like the Tesla car, ludicrous) with autobahn worthy top speed. Dekes and dangles to make the milk in your Tim’s or Starbucks curdle. Shots worthy of the Harlem Globetrotters. The overall game – not so much but it is coming. Hopefully, the Detroit way – in the minors until he ripens and is ready to pick – will pull him through. Tyler Bertuzzi met or exceeded expectations last year both in Guelph and in Grand Rapids during his short stay at the end of the year. The nephew of former Red Wing, Todd Bertuzzi, plays a similar game – willing to get his nose dirty and the ability to bring some offense. Although I don’t think Tyler has the high-end abilities of his uncle, his abilities are sufficient to result in his addition to the Red Wing line-up in the not too distant future. Trending up, way up. Axel Holmstrom is a 7th round pick from 2014 who last year broke Daniel Sedin’s SHL (top Swedish professional league) record for most points in the playoffs for a junior player. He was also named Swedish Junior Player of the Year. Here is what Detroit Red Wings Assistant General, Ryan Martin, told MLive.com about Axel, “He’s smart, gritty, competitive, likes to go to the front of the net. He has good hands and hockey sense. He needs to work on his skating. (Red Wings director of European scouting) Hakan Andersson really likes him. He’s trending upwards.” Although Detroit just signed him to a three year contract, he will likely return to Skellefteå AIK in the SHL for 2015-16. Tomas Nosek is an undrafted player from the Czech Republic who the Red Wings signed in the 2014 off-season after he led his club, Pardubice in the Czech Extraliga in scoring in 2013-14 (44 points in 52 games). He possesses NHL size (6’3, 209), the leadership you like to see in a player (Captain of Czech Republic U20 team in 2011-12), the good defensive abilities that you care about for a NHL 3rd or 4th liner plus decent offensive abilities. His skating is good but not of the breakaway variety. He is currently more of a passer than a shooter but he certainly can put the puck in the net as well. He had a very good first season in the AHL where he was the AHL leader in plus minus (+30) and had 34 points in 55 games. He is a player that I suspect Red Wing fans will see a lot more of in the future. "A sweet feed from Joe Hicketts, and a 2-0 lead" Atta boy @Hicksy_2!